I’d like to congratulate all of our winners! The winners should’ve already received an email from UPrinting with information about their prize. 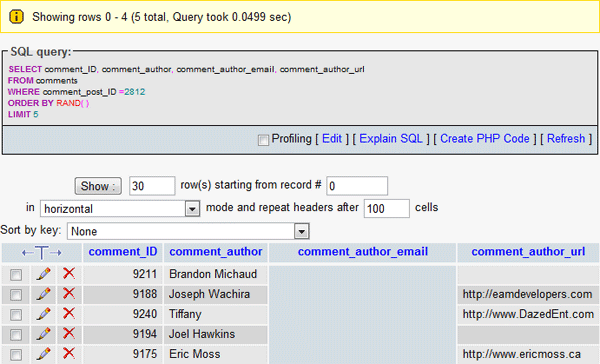 SQL query that selected the winners randomly. Email addresses of the winners were removed in the above image. The sponsor of this wonderful giveaway is UPrinting. They are one of the leading major online printing companies out there. They deliver top-quality printing services and offer a wide variety of products, including business cards, brochures, envelopes, greeting cards, posters, canvas prints and many more!